A few posts ago, I hinted at some looming major life changes. By now, many of you know that the shakedown has happened. It’s official. We’ve signed a lease for a new flat over in Mission Bay. It’s an adorable 2 bedroom – WE HAVE A GUEST BEDROOM – very near the lovely Kepa Bush Reserve and a 10 minute bike ride to the sea. Floor no more! Sorry you had to sleep on sofa cushions when you visited us Julia. We’re upgrading and ya’ll are welcome to visit us anytime…taking bookings now. And yes, the grass is really greener in New Zealand. So although it feels like we’ve been in the middle of a tempest for the last week straight, things seem to be moving and shaking in a positive direction. Before you’re all like, “Look at all the obnoxiously sweet things that are happening in Brittany’s life,” I’d like to remind you that it has not been an easy road to haul and the gods aren’t just sprinkling me with good fortune. April 18, 2013: Arrives in Auckland – indebted to boyfriend – visits all decent looking eateries dropping off CV. May 2, 2013: Gets job at The Blue Breeze Inn, a modern Chinese fusion restaurant where the uniform is a silk Hawaiian flower shirt and you have to use your best BIG GIRL VOICE to be heard because of the terrible acoustics. August 1, 2013: Quits job at Blue Breeze to go work at O’Connell Street Bistro. Makes it through one week before getting yelled at for polishing cutlery too loudly by pink-faced boss and quits to go work at a social media company. August 19, 2013: Begins work at Castleford Media, a social media company based out of Sydney (based out of London), that has outsourced to Auckland because labor’s cheaper here. Works stupidly long hours. Stops exercising. Complains constantly. Cannot write fast enough. Starts to hate writing. September 3, 2013: Takes the GRE. Starts preparing grad school essays. October 15, 2013: Puts in 2 weeks notice at Castleford. October 19, 2013: After two trial shifts, gets offered a job at The French Cafe, a “3 Hat” fine dining establishment in Auckland, and one of the best restaurants in New Zealand. November 1, 2013: Begins work at French Cafe. Enjoys the job but often feels nagging pull of existential life crisis. November 1 – December 31, 2013: Submits 6 graduate school applications. Meanwhile, continues to search and apply for any jobs in Auckland that meet qualifications. January 1 – March 1, 2014: Gets accepted to 5 out of 6 graduate schools (and wait-listed at Berkeley). Hooray! Immediately commences funding crisis. March 18, 2014: Spends a pretty penny to submit partnership-based visa to immigration. Avoids being kicked out of the country in April. April 24, 2014: Applies for Les Mills Social Media role. May 1, 2014: Puts down a deposit on Boston University. Chooses them largely because they’ve offered the most generous scholarship. Continues to battle funding crisis and mad scramble for Graduate Assistantship, without which future of debt is certain. May 13, 2014: Secures first interview with Les Mills! Despite getting lost and arriving late, the meeting goes well. Leaves feeling positive. May 28, 2014: Second interview with Les Mills. Excited about prospects. Still feels mounting panic, no graduate assistantship on the horizon. June 11, 2014: Les Mills checks references. Finally sees glimpse of light at the end of the tunnel. June 23, 2014: Les Mills contract arrives by courier just after sunset. I was hiking with my mum at Franz Joseph Glacier on the West Coast of New Zealand. It was a dreary day in Franz Joseph, but we were determined to see the sights. The melting glacier feeds into a relatively massive river and we started walking on a trail that weaves alongside it. Right away we noticed a couple – we speculated from the Netherlands – who were both tall, square-shouldered, and had very defined facial features. They were also wearing matching yellow raincoats, which caused us to nickname them the Yellow Jackets. She had on calf-height suede boots, and I remember thinking that was very impractical given the weather. The Yellow Jackets were always just behind us, to the point where if we’d stop to take a photo they would pass us, then they’d stop and we would pass them. The glacier’s quite a tourist attraction, but all the same it doesn’t happen very often in New Zealand that you get tailed on a trail. Anyway, this went on for some time, until finally we went a different direction and didn’t see them for awhile. We headed out to this little viewpoint and I really had to pee, so I told my mum to go ahead and I stepped off the trail in search of some good coverage. Unfortunately, this particular spot was a narrow strip of land leading out toward a lake, and there were slim pickings as far as good foliage to squat behind. We hadn’t seen anyone in long enough that I just decided to go for it. I got myself organized and started to go when I heard voices and the crunch of boots. Knowing I was in full view of the trail – and that anyone who walked by had pretty much a 100% chance of seeing my bum, I began to panic. I couldn’t exactly stop mid-pee, but I tried mightily and began to pull my pants up regardless. Low and behold, as I was struggling to sort out my situation I saw the flash of a yellow jacket as it rounded the corner. The man had a giant camera and he was actively staring into the bush looking for photo-opportunities. Absolutely cornered – and certain he would spot me – I adopted what I like to call the “Dora the Explorer” pose, in which you crouch down low and put a hand to your forehead (imagine a salute) and act as if you’re peering into the bush, tracking some amazing animal. I didn’t move – I reckon I didn’t even blink – as they approached. When they were finally right next to my patch of forest the man looked directly into the bush. As predicted he spotted me and gave a start. I pretended to remain transfixed by the imaginary rare bird I was tracking. After what seemed like an eternity they passed by and I stood up, got myself organized, and climbed out of the bush. To make matters even more awkward, the trail dead-ended at this little viewpoint where my mum was waiting for me. I knew I would have to go fetch her and face the Yellow Jackets once more. I did my best to appear confident and carefree as I reached the viewing platform. Ever observant, the Yellow Jackets turned as I walked up and we locked eyes for a moment, and in that moment I knew that they knew that I knew. 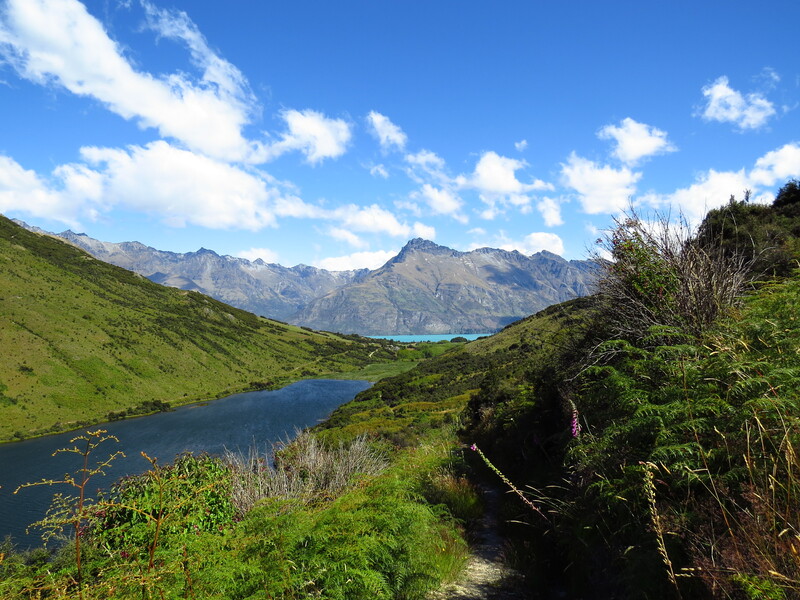 I quickly took in the view (I’ve seen lakes before…) and then suggested that we head back. As mum and I strolled away from the lake, I filled her in on the details of what had just transpired. She began to laugh so hard that tears streamed down her face and I thought she might pee her pants.